Ecoventura's (http://www.ecoventura.com) environmentally friendly fleet of small expedition vessels in the Galapagos will alternate two 7-night itineraries approved by the Galapagos National Park and Marine Reserve beginning on Jan. 29, 2012. Three 20-passenger sister yachts, MY Eric, Flamingo and Letty are charged with helping protect and preserve the fragile eco system while engaging guests in the splendors of the Galapagos archipelago. Cruise rates start at $3,350 per person double occupancy per week. Shorter options are sometimes available on seasonal departure dates only for a 5 or 6 night cruise. "Our team of experts carefully developed two distinct itineraries that would best benefit our client's interests and allow them to see the greatest variety of species of wildlife possible," explains Ecoventura spokesperson Doris Welsh. "The two weeklong itineraries can easily be combined to create the ultimate Galapagos experience providing a comprehensive view of the region's geology, history, wildlife and culture." The itineraries complement park efforts to reduce erosion, pressure and possible stress on wildlife at the 14 most popular central visitor sites in the archipelago. This is being accomplished by redistributing visitor numbers across more sites away from the Central Islands. All tour boats in Galapagos must comply with this new regulation which will ultimately enhance visitor experience, said Welsh. 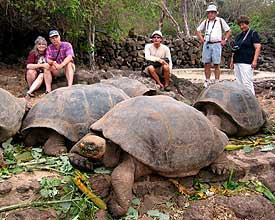 Both itineraries offer two guided land visits daily, snorkeling, dingy rides and kayaking, together optimizing opportunities to see iconic species of wildlife that make Galapagos famous: giant tortoises, penguins, frigate birds, boobies, flamingos, Darwin Finches, albatross, flightless cormorant, marine and land iguanas, lizards, many varieties of sea birds, whale, dolphins, sea turtles, sharks and sea lions. Passengers who chose Itinerary A will visit the Southern & Central islands stopping at La Galapaguera, Cerro Brujo, Punta Pitt on San Cristobal, Punta Suarez and Gardner Bay on Espanola, Punta Cormorant, Post Office Bay and Devil's Crown on Floreana, Humedales, Wall of Tears, Sierra Negra on Isabela, Bartolome, Black Turtle Cove and South Plaza Island as well as the highlands of Santa Cruz. Passengers who book Itinerary B will visit the Northern & Western islands stopping at Playa Ochoa, Leon Dormido in San Cristobal, Prince Philips Steps and Darwin Bay in Genovesa, North Seymour, Bachas Beach, Darwin Station on Santa Cruz, Punta Espinoza in Fernandina, Tagus Cove, Elizabeth Bay and Urbina Bay in Isabela, Puerto Egas on Santiago, Santa Fe and Rabida Island. After Jan. 29, 2012 Ecoventura guests can combine the two itineraries for an all-encompassing two-week program. Guests who book two consecutive weeks back to back are eligible for a 5 percent discount applicable any week (excluding holidays). For scuba divers who want to combine diving in Galapagos with wildlife top side, the fleet's luxury dive live-aboard, Galapagos Sky offers one week in tandem with a second week on Eric, Flamingo or Letty. Passengers are eligible for a 5 percent discount on selected departure dates. To reserve a cabin or private charter, or to receive a copy of Ecoventura's 2011-2012 catalog please call toll-free 1.800.633.7972, or e-mail info@galapagosnetwork.com. To access current rates, schedules and itineraries log on to http://www.ecoventura.com/.